Different types of wood bits are designed to drill the wood with varying precision and finish. Even though many wood drill bits might look similar, their need and finishing on the wood will be hugely different. 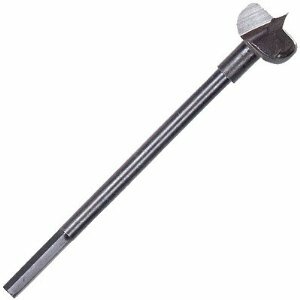 Brad point bits are the types of wood bits that has w point tip, which is also known as brad point tips, that has outside cutting edges that will mark a diameter on the wood before the center bit thrusts inside. This results in a smooth and soft finish on the wood and creates a clean hole. Spade bits can be considered as an extended version of brad point bits. Spade bits comes with different spike and angle spurs that makes them the best types of wood bits for making large holes. Augur bits are the types of wood bits that can be used for drilling large and clean holes on thick and dry timber. The specialty of augur bits is that they have a screw tip in the friend that can draw the shank into the wood and this reduces the effort that should be given to push the drill inside. The large flutes of the bit remove the wood chips rapidly while the single spur edge gives the smooth finish to the hole. Counter sink bits are used to create a beveled opening for the pilot holes on the wood. These bits come in different sizes and different styles are also available depending on the type of the wood. Three flute hogger bits contain three patterns of flute and has a uniquely designed scalloped cutting edge. These types of wood bits are designed for obtaining high feed rates in dense wood materials. However, a finisher bit also that will give smoothness to the wood should follow application of these bits. Reduced shank bits are the types of wood bits used for drilling large holes. These bits have a reduced shank as the name suggests. Maximum wear compression bits are designed for application on thicker, dense and dry wood materials so that the bits will have a longer life. Their spur design gives smoothness to the finish and is available in different sizes. These are the types of wood bits that come with just two patterns of flute. Double flute chip breaker bits are really good for applying on hard wood materials. The chip breakers help in reducing the cutting forces and also give a smooth finish to the holes. Plug cutting bits are the bits that are used for cutting plugs out of wood that can be used for concealing recessed screw holes on furniture and other wood works. To get a better finish, it is advised to drill out the plug from similar types of wood materials and use the plugs only on the furniture that are to be varnished soon.